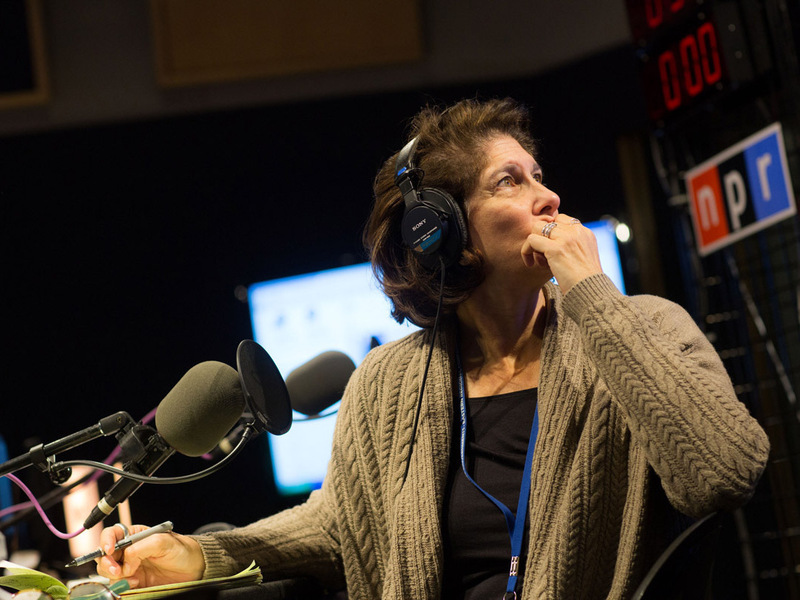 A Fair And Balanced Look At Mara Liasson : NPR Public Editor NPR's national political correspondent Mara Liasson is also a contributor to Fox News. Some listeners complain that she has a conservative bias. A review of her work finds otherwise. National political correspondent Mara Liasson on election night in 2012. What to do about NPR's national political correspondent Mara Liasson? This is a regular issue raised by some NPR listeners who object to Liasson's second role as a contributor to Fox News. They say that she, like Fox, tilts to the right. "Would you please consider letting Mara Liasson go?" wrote listener Michael Duba in what is typical of the several complaints that come in almost every time Liasson does a story. "Her affiliation with the Tea Party channel and willingness to just go along with whatever is said by others on the fake news shows she appears on has ruined whatever small remaining shreds of credibility she had left." Joan Jones, of Madison, Wis., wrote, "If Ms. Liasson wishes to be respected, I suggest that she refrain from using Republican or 'Tea Party' talking points in her reporting. In her reporting on the Affordable Care Act in particular, you are obligated to go beyond the talking points to get to the truth of an issue." I have followed Liasson's work closely for the last 10 weeks, through four of the most ideologically and politically contentious minefields imaginable. These were the considerations to attack Syria, the government shutdown, the threat of debt default and the implementation of the Affordable Care Act. As a national political correspondent, Liasson filed frequently on each. I also have looked at some of her contributions to Fox, where she is called on as an outside political expert. I find that her NPR stories were straightforward and based on solid reporting. Her Fox contributions were the same. She was smartly analytical, but did not take a position on issues or veer into opinion. Just as important, she did not tilt or load her characterizations of political figures such as President Barack Obama or Republican leaders. Much of the complaints about Liasson, it seems to me, are really about Fox. The complaining listeners do not like Fox's rightward stance, and especially the incendiary views of some of its prime time talk show hosts such as Bill O'Reilly. They tar Liasson by association. The criticism is partly an extension of the furor that led to the firing of Juan Williams three years ago. Whatever you may think of how NPR handled that case, it is very different from this one. Williams did much outright opinion commentary; Liasson is strictly a reporter. Mara is a first class reporter. She has a keen understanding of national politics and does a beautiful job helping our audience make sense of what's unfolding in Washington and across the country. As for her Fox appearances, we reviewed this issue when we were re-writing NPR's ethics guidelines in 2011 and early 2012. We think Mara's TV appearances are fine. There too, she does a very good job sharing her knowledge, insight and reporting expertise. We view this as an opportunity for a broader audience to benefit from NPR's editorial depth. ...[W]e refrain from appearing on television discussion shows where the format is designed to produce heated, highly political debates. We go on TV to talk about our reporting and the news of the day, not to offer opinions (with the obvious exceptions of our music, arts and books critics — and, if any are hired, news commentators). If asked to offer opinions when on the air, we rely on our reporting and offer context — citing, for example, what public opinion polls signal about how an issue is playing rather than our personal opinions. From what I could see, Liasson was not put in positions by Fox interviewers that violate the handbook, though I acknowledge that my review of her Fox work was limited. Some liberal listeners of NPR may not want to hear what Jones above calls "Tea Party 'talking points.'" Listeners are right to be concerned about the uncritical reporting of misleading claims and half truths made by any political group. But Liasson is a political reporter whose job precisely is to report and analyze political maneuverings. Others at NPR are the experts on issues such as Syria and health care, which they dissect in other stories. This is not to say that political stories should not add context on issues, and many of Liasson's stories did. President Obama has had a tough year. He failed to pass gun legislation; immigration reform has stalled in the House. He barely escaped what would have been a humiliating rejection by Congress on his plan to strike Syria. Just this week, his own Democrats forced Larry Summers - the president's first choice to head the Federal Reserve - to withdraw. This might seem negative about Obama, but it is a fair and accurate summary of events. She is hardly kinder to Republicans. She came back in the same story to note "Republican chaos" over the government shutdown and threatened debt default. "The president is on firmer footing with the public who may not like Obamacare, but don't want it repealed or defunded," she said, reporting what polls show. She concluded: "President Obama is willing for now to let the Republicans flirt with the unpopular and dangerous possibilities of a government shutdown and a debt default." On All Things Considered in August, Liasson said of the president's reversals over Syria that "this is a box entirely of President Obama's own making" — a harsh judgment perhaps, but again a true one. In October, on Morning Edition, she said during the government shutdown that now it was the Republicans who were in a "box they've gotten themselves in." All this is not what some critics and I call "false equivalence": giving all sides equal time, even those who are demonstrably wrong. It is accurate analysis that captures the flailing on both sides as they maneuver for political advantage or try to avoid political blame. Well, let's be very, very specific about what the president has refused to negotiate on. He said he would absolutely not negotiate around the debt ceiling. He said Congress has already spent the money. It's their job to raise the debt ceiling so we can borrow the money to cover the bills that they've already incurred. He said he will certainly not negotiate about Obamacare in terms of defunding it or delaying it. But he has said that he would negotiate over the budget. Remember, every time we've gotten up to this brink in the past, we've talked about the grand bargain, where the president would agree to cut entitlements and Republicans would agree to raise some kind of tax revenue. Those talks have always fallen apart, but the president said he's still ready to cut entitlements if Republicans are ready to raise revenues, which they say they are not. It's hard to believe, but I think Ted Cruz, who's been the leader of the stop-Obamacare-at-any-cost caucus, the guy who stood on the floor for 21 hours in the Senate, he has actually come out of this a political winner. Not with the media, not with his Republican establishment colleagues who consider him an annoying grandstander, but certainly with the Tea Party base of the Republican Party, the people who make up the Republican presidential primary electorate - his stock has soared. And you can see that Rand Paul and Marco Rubio, who are the other two senators who are considering running for president in 2016, they have been standing with Cruz all along. This is not Republican cheerleading. It is clear, tough and accurate reporting. Obamacare is not only the law of the land, it's also, as of today, a practical reality for millions of Americans. But as a political issue, it's far from settled and won't be anytime soon. She was addressing the political question, as opposed to analyzing the rollout of the act itself. But the political story is an important one and part of the rollout — and her job is to examine and explain the politics of such issues. A week ago, on Morning Edition, Liasson confronted the revelation that some Americans were seeing their old heath care policies canceled as a result of the Affordable Care Act, in contradiction to what Obama had repeatedly promised — "period," he emphasized. But that's just not true, in every case. What we're talking about here is about 5 percent of the population who are in the private individual market. They don't get their health care through their employer, or through Medicare or Medicaid. And some of them - we don't know how many of them - are seeing their plans canceled when their 12-month contracts come up because their plans don't meet the new standards for coverage in the Affordable Care Act. Now, some of these people are going to have to pay a little more; some of them will pay less. The White House says in the end, more people will end up with better coverage and in some cases, cheaper coverage because of the subsidies. But the fact is, the Affordable Care Act is a disrupter. This is why the White House wanted this rolled out after the president was re-elected. And the problem is that the president raised expectations. He went out and said the website will be as easy to use as buying a plane ticket on Kayak. He said your insurance won't change, if you like it. But health insurance is very complicated. There are premiums, and there are deductibles, and there are co-pays; and the law affects different people in different ways. So for every positive anecdote, you can find a negative one. The president made it sound so simple, and those promises are now coming back to haunt him. Well, he's got to fix the website; that's the first thing. But in a year from now, when we have the 2014 elections — and this will be the first time that there will be electoral verdict on the actual health care law. It's always been theoretical; you know, what people think about the law without the law being in effect. This time, it's on the ground. People are going to be able to touch it and feel it and experience it. He has to hope that the kinks are ironed out and that net — net — people think this law is a good thing for them.